Metal roofing is a building material used to protect a building from moisture, wind and other exterior elements. These roofs can be used on residential or commercial structures and are available in a wide variety of materials and finishes. Metal roofing is often chosen for its attractive appearance, durability and long lifespan, though this product also offers many additional benefits. Metal roofing is generally made from steel, aluminum, copper or tin. Steel is the most common and may be coated with zinc to reduce maintenance and rust. It is typically painted on site or sold with a baked-on finish. Aluminum is more expensive but tends to hold up better in coastal areas because of its anti-corrosive properties. 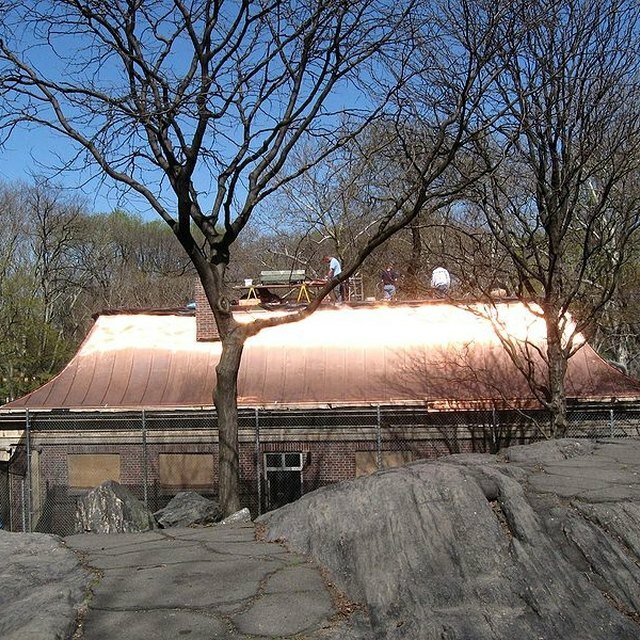 Copper is chosen for its rich coloring, though it tends to be the most expensive of all metal roofing materials. Tin is a lightweight metal roofing option primarily used on barns and sheds. Metal roofing is available in several different forms that can be used to complement various architectural styles and decors. It is often sold in the form of panels, which may be flat or embossed. Steel is often installed using a standing-seam system made from interlocking panels. Many metal roof materials are designed to resemble shingles or tiles and may be styled to resemble traditional wood or ceramic roofing materials. A metal roof is typically installed over plywood or OSB roof sheathing. The sheathing may be covered with a moisture barrier to prevent leaks or even with foam insulation to help reduce thermal transfer through the roof. On a flat roof, metal panels are nailed directly to the sheathing or moisture barrier. With sloped roofs, metal panels are often installed to a system of metal lathes to help reduce noise and rattling from wind or other weather-related elements. Metal roofs are lightweight, especially when compared to ceramic or slate tiles. They require little maintenance and can easily last for 50 years or more. Most metal roofing materials are not affected by rain, hail, snow or wind and are naturally fire resistant. Some metal roofs are chosen for their aesthetic appeal, particularly when they are partially visible from within the building. Metal roofing installation is generally performed by professionals and is not recommended for do-it-yourself installers. It also tends to be more expensive than other roofing materials and must be repaired by a professional if damaged. Painted metal roofs will require regular repainting to maintain their appearance. Steel roofs may also be susceptible to rust, while softer metals like aluminum or tin may dent easily if walked on or exposed to sharp impacts.